Taste test: These kettle-cooked chips were very crunchy and tasted OK, but there was just the slightest amount of hot sauce flavor. 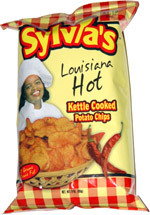 You had to eat a bunch of chips to get any real heat, so these were kind of a disappointment. The chips were unbroken, but the bag was only filled up abot 1/3 of the way to the top (though it was labeled at just 3 oz., which is fairly small net weight for this size of bag). Smell test: Very mild hot sauce sort of smell.